Lawn or core aeration is a process that requires punching holes into the turf and underlying soil. This breaks up compacted soils and allows water and air to penetrate these layers and easily make their way to the roots. Ideally, this practice should be performed once a year. The guide below explains how to optimize this task during spring. When Should You Aerate Your Lawn in Spring? Spring aeration can be tricky. If performed at the wrong time, it could stir up the germinating weeds and give them a place to start growing. It could also stress out the turf and cause it to brown or become overrun with pests. 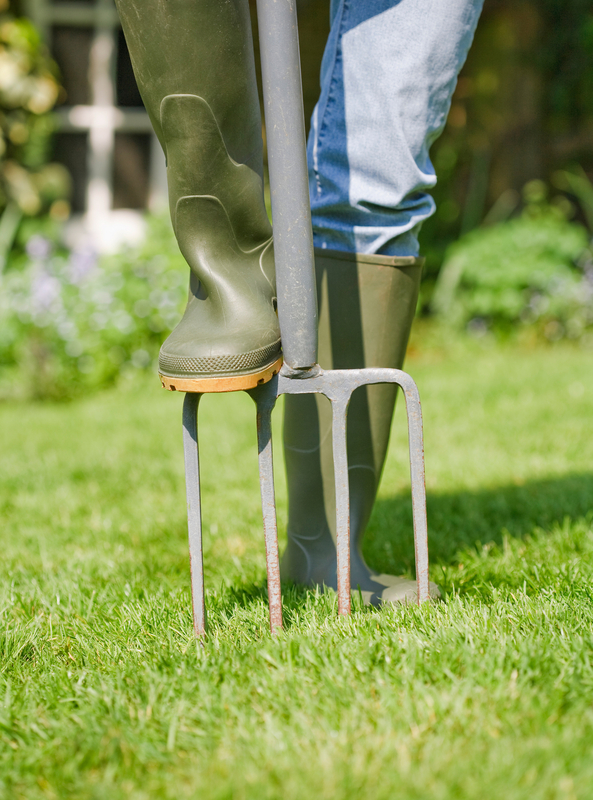 The best way to determine when to aerate is by looking at the type of lawn you have. If aerating a cool-season grass, like bluegrass and fescue, it’s best to do so early into the season before temperatures start to reach 55 degrees and weeds begin to germinate. Warm-season grasses—including zoysia, Bermuda, and St. Augustine—can wait until later in the season when the temperatures have warmed and the grass has fully returned. If you live in a region like Alabama that offers few cooler weather days during the early days of spring, aeration is not often possible for cooler grasses. If you notice signs of compacted soil, such as puddling water and stunted growth, you’ll need to perform other lawn care remedies. To start, stay off the lawn whenever possible to avoid increasing compaction. Gardening professionals also suggest layering compost or other organic materials because as they break down, the soil becomes aerated in the process. Naturalists also recommend adding earthworms to heavily compacted areas and letting them eat their way through the soil, creating aeration holes in the process. The best way to prevent soil compaction is to perform aeration at least once a year. If spring is the best time to aerate your lawn, contact the professionals at Lucky Lawn Service Inc. They provide a range of lawn care and maintenance services—including weed control, fertilization, and insect control—to residents in Enterprise, AL. Call them today at (334) 347-8873 for a free estimate and visit their Facebook page for more ways to care for your grass.